New Angel Umbra Comes to Fight with You! After the arrival of Angel Venus and Demetria, new angel Umbra has now come to League of Angels II to fight with warriors. Umbra, the angel of darkness, is a powerful Artifact angel. The Holy Grail in her hand can turn shadow and darkness into immense power. Umbra has cold appearance and calm personality, which makes her a perfect fighter in battle. Let's know more about her abilities. Umbra's unique skill "Curse of Shadow" can reduce ATK and DEF of all enemies by 20%, and also greatly reduce their Crit, lasts 2 turns. As the third Angel Deploy slot has been added, this new angel will greatly boost your squad strength! Please note that special item Angelic Scrolls are required to unlock the third slot. From Sep. 15th to Sep. 20th, Angel Umbra will be available in Cross-Server Resource Tycoon. Collect various resources and rank higher in the tycoon rankings, you'll have the chance to get Angel Umbra and many other resources. Hurry up to take Umbra to your squad! 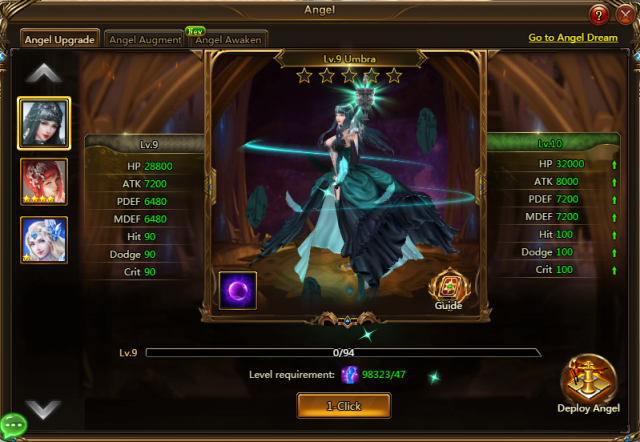 Play League of Angels II now and enjoy the simple joy!